Native Hawaiians, activists and supporters commemorate January 17 annually. Members of the Royal Order of Kamehameha I in 2012. Opposition to the overthrow and annexation included Hui Aloha ʻĀina or the Hawaiian Patriotic League. The Nation of Hawaiʻi is the oldest Hawaiian independence organization. It is headed by Dennis Puʻuhonua "Bumpy" Kanahele,  who is the group's spokesperson and Head of State. In contrast to other independence organizations which lean to the restoration of the monarchy, it advocates a republican government. Kealoha Pisciotta, a former systems specialist for the joint British-Dutch-Canadian telescope,   who became concerned that a stone family shrine she had built for her grandmother and family, years earlier, had been removed and found at a dump. She is one of several people who sued to stop the construction of the Thirty Meter Telescope  and is also director of Mauna Kea Anaina Hou. Mauna Kea Anaina Hou ("People who pray for the mountain", ) and its sister group, Mauna Kea Hui, are indigenous, Native Hawaiian, cultural groups with environmental concerns located in the state of Hawaii. The group is described as "Native Hawaiian organization comprised of cultural and lineal descendants, and traditional, spiritual and religious practitioners of the sacred traditions of Mauna Kea." In 1976, Walter Ritte and the group Protect Kahoolawe Ohana (PKO) filed suit in U.S. Federal Court to stop the Navy's use of Kahoolawe for bombardment training, to require compliance with a number of new environmental laws and to ensure protection of cultural resources on the island. In 1977, the U.S. District Court for the District of Hawaii allowed the Navy's use of this island to continue, but the Court directed the Navy to prepare an environmental impact statement and to complete an inventory of historic sites on the island. The effort to regain Kahoʻolawe from the U.S. Navy inspired a new political awareness and activism within the Hawaiian community. Charles Maxwell and other community leaders began to plan a coordinated effort to land on the island, which was still under Navy control. The effort for the "first landing" began in Waikapu (Maui) on January 5, 1976. Over 50 people from across the Hawaiian islands, including a range of cultural leaders, gathered on Maui with the goal of "invading" Kahoolawe on January 6, 1976. The date was selected because of its association with the United States' bicentennial anniversary. The nonprofit organization, Naʻi Aupuni will organize the constitutional convention and election of delegates using the roll which began collecting names in 2011. Kelii Akina, Chief Executive Officer of the Grassroot Institute of Hawaii, filed suit to see the names on the roll and won, finding serious flaws. The Native Hawaiian Roll Commission has since purged the list of names of deceased persons as well as those whose address or e-mails could not be verified. On November 24, the emergency request was made again to Supreme Court Justice Anthony Kennedy. November 27, Justice Kennedy stopped the election tallying or naming of any delegates. In the United States Supreme Court case, Rice v. Cayetano, Kennedy wrote, "Ancestry can be a proxy for race". ^ Michael Kioni Dudley; Keoni Kealoha Agard (January 1993). A call for Hawaiian sovereignty. Nā Kāne O Ka Malo Press. p. 167. ISBN 978-1-878751-09-6. ^ "Kanahele group pushes plan for sovereign nation". www.hawaii-nation.org. Retrieved 2016-11-13. ^ Grass, Michael (August 12, 2014). "As Feds Hold Hearings, Native Hawaiians Press Sovereignty Claims". Government Executive. Government Executive. Retrieved October 29, 2015. ^ http://www.pireport.org/articles/2000/02/11/us-purchase-palmyra-hits-impasse U.S. Purchase of Palmyra Hits Impasse. February 10, 2000. Retrieved 30 January 2018. ^ https://www.culturalsurvival.org/publications/cultural-survival-quarterly/struggle-hawaiian-sovereignty-introduction The Struggle For Hawaiian Sovereignty - Introduction. Trask Haunani-Kay. Cultural Survival. Retrieved 30 January 2018. ^ a b https://www.gpo.gov/fdsys/pkg/STATUTE-107/pdf/STATUTE-107-Pg1510.pdf Public Law 103-150 — Nov. 23,1993. gpo.gov. Retrieved July 3, 2018. ^ "Historic election could return sovereignty to Native Hawaiians". Retrieved 2016-11-13. ^ a b Haunani-Kay, Trask (2010-04-02). "The Struggle For Hawaiian Sovereignty – Introduction". Cultural Survival. Retrieved 2016-11-13. ^ American Bar Association (June 1997). ABA Journal. American Bar Association. pp. 75–76. ISSN 0747-0088. ^ "Civil Rights Panel Backs Federal Recognition For Native Hawaiians". Honolulu Civil Beat. 2018-12-20. Retrieved 2018-12-20. ^ Beary, Brian. "Hawaiians (United States)." Separatist Movements: A Global Reference, CQ Press, 2011, pp. 96–99. ^ "Recent Survey of Hawaii residents shows two out of three oppose Akaka bill". new.grassrootinstitute.org. Honolulu, HI: Grassroot Institute. 2015-07-05. Retrieved 2016-08-29. ^ Tucker, Spencer C. (20 May 2009). Encyclopedia of the Spanish-American and Philippine-American Wars, The: A Political, Social, and Military History. ABC-CLIO. p. 275. ISBN 978-1-85109-952-8. ^ Tate, Merze. (1965). The United States and the Hawaiian Kingdom: A Political History. New Haven and London: Yale University Press. p. 235. ^ a b c d "Hawaiian Papers". Manufacturers and Farmers Journal. 75 (4). January 11, 1894. p. 1. ^ a b c "Willis Has Acted". The Morning Herald. United Press. January 12, 1894. ^ "Minister Willis's Mission" (PDF). The New York Times. The New York Times Company. January 14, 1894. ^ "Defied By Dole". Clinton Morning Age. 11 (66). January 10, 1894. p. 1. ^ "Quiet at Honolulu". Manufacturers and Farmers Journal. 75 (4). January 11, 1894. p. 2. ^ https://www.britannica.com/biography/Sanford-Ballard-Dole Sanford Ballard Dole. Britannica.com. Retrieved July 3 2018. ^ https://www.law.cornell.edu/topn/newlands_resolution_annexation_of_hawaii Newlands Resolution - Annexation of Hawaii. Law.cornell.edu. Retrieved July 3, 2018. ^ https://www.hawaii-nation.org/statehood.html Is Hawaii Really a State of the Union? Hawaii-nation.org. Retrieved July 3, 2018. ^ Davianna McGregor (2007). Na Kuaʻina: Living Hawaiian Culture. University of Hawaii Press. p. 279. ISBN 978-0-8248-2946-9. ^ a b https://intercontinentalcry.org/towards-hawaiian-independence Towards Hawaiian Independence: Native Americans warn Native Hawaiians of the dangers of Federal Recognition. Intercontinentalcry.org. Imani Altemus-Williams. December 7, 2015. Retrieved July 3, 2018. ^ Kamehameha V (King of the Hawaiian Islands) (1865). Decree to Establish the Royal Order of Kamehameha I. by Authority. ^ Brien Foerster. The Real History Of Hawaii: From Origins To The End Of The Monarchy. Lulu.com. p. 72. ISBN 978-1-300-46126-5. ^ Ralph S. Kuykendall (1 January 1967). The Hawaiian Kingdom: 1874–1893, the Kalakaua dynasty. University of Hawaii Press. p. 221. ISBN 978-0-87022-433-1. ^ Bill Mossman. "Way of the Warrior: Native Hawaiian lecture series reveals ancient secrets". U.S. Army Garrison-Hawaii. Retrieved 2009-09-28. ^ a b Neil Thomas Proto (2009). The Rights of My People: Liliuokalani's Enduring Battle with the United States, 1893–1917. Algora Publishing. p. 44. ISBN 978-0-87586-721-2. ^ "The Principality of Aloha". Archived from the original on 2013-01-12. Retrieved 2017-03-27. ^ Fixico, Donald L. (12 December 2007). Treaties with American Indians: An Encyclopedia of Rights, Conflicts, and Sovereignty [3 volumes]. ABC-CLIO. p. 207. ISBN 978-1-57607-881-5. ^ Budnick, Rich (1 January 2005). Hawaii's Forgotten History: 1900-1999: The Good...The Bad...The Embarrassing. Aloha Press. p. 154. ISBN 978-0-944081-04-4. ^ Kahu Charles Kauluwehi Maxwell, Sr. "Spiritual connection of Queen Liliuokalani's book "Hawaii's Story" to the forming of the Aboriginal Lands of Hawaiian Ancestry (ALOHA) to get reparations from the United States Of America for the Illegal Overthrow of 1893". Retrieved 2010-04-30. ^ a b Keri E. Iyall Smith (7 May 2007). The State and Indigenous Movements. Routledge. ISBN 978-1-135-86179-7. ^ Haunani-Kay Trask (1 January 1999). From a Native Daughter: Colonialism and Sovereignty in Hawaiʻi. University of Hawaii Press. p. 74. ISBN 978-0-8248-2059-6. ^ Apgar, Sally (2005-09-25). "Women of Hawaii; Hawaiian women chart their own path to power". Honolulu Star Bulletin. Retrieved 2010-04-30. ^ Franklin Ng (23 June 2014). Asian American Family Life and Community. Routledge. p. 260. ISBN 978-1-136-80123-5. ^ a b Noelani Goodyear-Kaʻopua; Ikaika Hussey; Erin Kahunawaikaʻala Kahunawaikaʻala Wright (27 August 2014). A Nation Rising: Hawaiian Movements for Life, Land, and Sovereignty. Duke University Press. ISBN 978-0-8223-7655-2. ^ Sonia P. Juvik; James O. Juvik; Thomas R. Paradise (1 January 1998). Atlas of Hawai_i. University of Hawaii Press. p. 182. ISBN 978-0-8248-2125-8. ^ a b Elvira Pulitano (24 May 2012). Indigenous Rights in the Age of the UN Declaration. Cambridge University Press. p. 323. ISBN 978-1-107-02244-7. ^ "Akaka bill and Ka Lahui Hawaii position explained". Ka Lahui Hawaii. Ka Lahui Hawaii. Retrieved 3 January 2015. ^ Donnelly, Christine (2001-10-01). "Akaka bill proponents prepare to wait for passage amid weightier concerns; But others say the bill is flawed and should be fixed before a full congressional vote". Honolulu Star Bulletin. Retrieved 2010-04-30. ^ Bernardo, Rosemarie. "Hawaiians find fault". 2004 Honolulu Star-Bulletin. Honolulu Star Bulletin. Retrieved 3 January 2015. ^ Chen MS (1994). "Richard Kekuni Blaisdell, M.D., Founding Chair, Department of Medicine, University of Hawaiʻi John Burns School of Medicine and Premier Native Hawaiian (Kanaka Maoli) health scholar". Asian Am Pac Isl J Health. 2 (3): 171–180. PMID 11567270. ^ Ibrahim G. Aoudé (January 1999). The Ethnic Studies Story: Politics and Social Movements in Hawaiʻi : Essays in Honor of Marion Kelly. University of Hawaii Press. p. 57. ISBN 978-0-8248-2244-6. ^ "A Century After Queen's Overthrow, Talk of Sovereignty Shakes Hawaii - NYTimes.com". Retrieved January 8, 2015. ^ "The Tribunal | Na Maka o ka `Aina". Retrieved January 8, 2015. ^ John H. Chambers (2009). Hawaii. Interlink Books. p. 286. ISBN 978-1-56656-615-5. ^ a b Phillip B. J. Reid (June 2013). Three Sisters Ponds: My Journey from Street Cop to FBI Special Agent- from Baltimore to Lockerbie and Beyond. AuthorHouse. p. 178. ISBN 978-1-4817-5460-6. ^ "United States' Compliance with the International Covenant on Civil and Political Rights" (PDF). International Indian Treaty Council and the United Confederation of Taino People. p. 4 (note 6). Retrieved 1 January 2015. ^ a b "Rebuilding a Hawaiian Kingdom". latimes.com. Los Angeles Times. Retrieved 1 January 2015. ^ "www.slate.com". Retrieved January 8, 2015. ^ "IMDB". Retrieved January 20, 2017. ^ Fiona Keating, Fiona (August 22, 2015). "Hawaii Statehood Day: Campaign for independence grows despite celebrations". Yahoo News. International Business Times. Retrieved 9 January 2016. ^ Bai, Eugene (October 2, 2015). "The Kremlin's double standards make it harder to talk with the West". Russia Direct. Russia Direct. Retrieved 9 January 2016. ^ Castro, Joseph. "Bridging science and culture with the Thirty Meter Telescope". Science Line. NYU Journalism. Retrieved 20 December 2015. ^ a b c Tsai, Michael (July 9, 2006). "Cultures clash atop Mauna Kea". The Honolulu Advertiser. The Honolulu Advertiser.com. Retrieved 20 December 2015. ^ Worth, Katie (February 20, 2015). "World's Largest Telescope Faces Opposition from Native Hawaiian Protesters". Scientific American, a Division of Nature America, Inc. Scientific American. Retrieved 22 April 2015. ^ Huliau: Time of Change. Kuleana ʻOiwi Press. 1 January 2004. ISBN 978-0-9668220-3-8. ^ Patrick Kenji Takahashi (29 February 2008). Simple Solutions for Humanity. AuthorHouse. pp. 163–164. ISBN 978-1-4678-3517-6. ^ Steven C. Tauber (27 August 2015). Navigating the Jungle: Law, Politics, and the Animal Advocacy Movement. Routledge. p. 138. ISBN 978-1-317-38171-6. ^ Sproat, D. Kapua`ala (December 2008). "Avoiding Trouble in Paradise". Business Law Today. 18 (2): 29. Retrieved 20 December 2015. ^ Miller, Steve (2010). "Mauna Kea and the work of the Imiloa Center" (PDF). EPSC Abstracts. European Planetary Science Congress 2010. 5 (EPSC2010): 193. Bibcode: 2010epsc.conf..193M. ^ Elizabeth Helen Essary (2008). Latent Destinies: Separatism and the State in Hawai`i, Alaska, and Puerto Rico. ProQuest. p. 70. ISBN 978-0-549-96012-6. ^ Laenui, Poka. "Processes of Decolonization". Archived from the original on 2006-03-23. Retrieved 2012-12-31. ^ Luci Yamamoto (2006). Kauaʻi. Lonely Planet. p. 35. ISBN 978-1-74059-096-9. ^ "Kahoolawe 9". firstlandingmovie.com. Retrieved June 15, 2014. ^ a b Mooallem, Jon (May 8, 2013). "Who Would Kill a Monk Seal?". The New York Times. Retrieved June 15, 2014. ^ Cicotello, Laurie (January 20, 2013). "Walter Ritte, Andrew Kimbrell address Hawaiʻi SEED event". The Garden Island. Retrieved June 15, 2014. ^ Sai, David Keanu. "Hawaiian Kingdom Government – Welcome – E Komo Mai". Honolulu, H.I. Archived from the original on 2012-11-25. Retrieved 2013-01-12. ^ Tanigawa, Noe (2014-08-29). "Hawaiʻi: Independent Nation or Fiftieth State?". hpr2.org. Honolulu, HI: Hawaii Public Radio. Retrieved 2015-01-04. ^ "International Arbitration – Larsen vs. Hawaiian Kingdom". Waimanalo, HI, USA: Aloha First. 2011-07-18. Archived from the original on 2012-11-08. Retrieved 2013-01-12. ^ "Most provocative notion in Hawaiian affairs". Honolulu Weekly. Honolulu, HI, USA. August 15–21, 2001. ISSN 1057-414X. OCLC 24032407. Archived from the original on 2012-04-18. Retrieved 2013-01-12. ^ International Law Reports. Cambridge University Press. 2002. ISBN 0-521-66122-6. ^ Sai, David Keanu. "Dr. David Keanu Sai (Hawaiian flag raised with others)". Retrieved 2010-04-30. ^ "Permanent Court of Arbitration: About Us". Permanent Court of Arbitration. Retrieved 2010-04-30. ^ Dan Nakaso (May 15, 2008). "Native Hawaiian group: We're staying". USA Today. Retrieved December 23, 2010. ^ "Francis A. Boyle – Faculty". Champaign, IL, USA: University of Illinois College of Law. Archived from the original on 2012-07-22. Retrieved 2013-01-12. ^ Finnegan, Tom (2008-01-28). "Radio station on Kauai rapped for suspensions". Honolulu Star Bulletin. ^ Gregg, Amanda C. "Resident seeks probe into KKCR". Kauai Garden Island News. ^ "Kanuha Found Not Guilty Of Obstruction on Mauna Kea". Big Island Video News. Big Island video News. January 8, 2016. Retrieved 9 January 2016. ^ "How Lanakila Mangauil came to Mauna Kea". The Hawaii Independent Corporation/Archipelago. The Hawaiian independent. Retrieved 9 January 2016. ^ Native Hawaiian Legal Corporation "Originally named the 'Hawaiian Coalition of Native Claims,' the organization fought against a then-new wave of dispossession from the land to make way for a boom in urban development. Since then, NHLC has worked steadily to establish Native Hawaiian rights jurisprudence." ^ "Professor Noenoe Silva". Honolulu, HI, USA: University of Hawaiʻi at Mānoa. 2011-11-03. Archived from the original on 2012-10-22. Retrieved 2013-01-12. ^ a b c "Reconciliation at a Crossroads: The Implications of the Apology Resolution and Rice v. Cayetano for Federal and State Programs Benefiting Native Hawaiians". US Commission on Civil Rights. usccr.gov. Retrieved 9 January 2016. ^ Glenda Bendure; Ned Friary (2003). Oahu. Lonely Planet. p. 24. ISBN 978-1-74059-201-7. ^ Jeff Campbell (15 September 2010). Hawaii. Lonely Planet. p. 47. ISBN 978-1-74220-344-7. ^ Eva Bischoff; Elisabeth Engel (2013). Colonialism and Beyond: Race and Migration from a Postcolonial Perspective. LIT Verlag Münster. p. 61. ISBN 978-3-643-90261-0. ^ Lyte, Brittany (September 16, 2015). "Native Hawaiian election set". The Garden island. The Garden Island. Retrieved 6 October 2015. ^ Grass, Michael (August 12, 2014). "As Feds Hold Hearings, Native Hawaiians Press Sovereignty Claims". Government Executive. Government Executive. Retrieved 6 October 2015. ^ Office of the Secretary of the interior. "Interior Considers Procedures to Reestablish a Government-to-Government Relationship with the Native Hawaiian Community". US Department of the interior. US Government, Department of the Interior. Retrieved 6 October 2015. ^ Hill, Malia Blom (January 2011). "Office of Hawaiian Affairs: Rant vs. Reason on Race". Honolulu, HI, USA: Grassroot Institute of Hawaii. Retrieved April 30, 2012. ^ "Supreme Court of the United States: Opinion of the Court". 2000. Retrieved 2010-04-30. ^ Hanafin, Patrick W. (2001). "Aren't We All Sovereign Now?". Retrieved 2010-04-30. ^ a b Lauer, Nancy Cook (September 30, 2015). "Interior Department announces procedure for Native Hawaiian recognition". Oahu Publications. West Hawaii Today. Retrieved 7 October 2015. 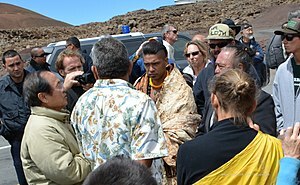 ^ "Interior Proposes Path for Re-Establishing Government-to-Government Relationship with Native Hawaiian Community". Department of the Interior. Office of the Secretary of the Department of the interior. Retrieved 7 October 2015. ^ Edward Hawkins Sisson (22 June 2014). America the Great. Edward Sisson. p. 1490. GGKEY:0T5QX14Q22E. ^ Ariela Julie Gross (30 June 2009). What Blood Won't Tell: A History of Race on Trial in America. Harvard University Press. p. 207. ISBN 978-0-674-03797-7. ^ a b Rick, Daysog (October 6, 2015). "Critics: Hawaiian constitutional convention election process is flawed". Hawaii News Now. Hawaii News Now. Retrieved 7 October 2015. ^ "Fed Appeals Court Won't Stop Hawaiian Election Vote Count". The New York Times. Associated Press. November 19, 2015. Retrieved 28 November 2015. ^ "Opponents Ask High Court to Block Native Hawaiian Vote Count". The New York Times. Associated Press. November 24, 2015. Retrieved 28 November 2015. ^ "Supreme Court Justice Intervenes in Native Hawaiian Election". The New York Times. Associated Press. November 27, 2015. Retrieved 28 November 2015. Daws, Gavan (1968). Shoal of Time: A History of the Hawaiian Islands. Macmillan, New York, 1968. Paperback edition, University of Hawaii Press, Honolulu, 1974. 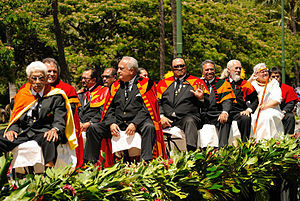 Native Hawaiians Study Commission (7 December 2006). "Native Hawaiians Study Commission Report – GrassrootWiki". Honolulu, HI, USA: Grassroot Institute of Hawaii. Retrieved April 30, 2012. "Hawaiian Journal of Law and Politics". Honolulu, HI, USA: University of Hawaii at Manoa. ISSN 1550-6177. OCLC 55488821. Retrieved 2012-01-12. "Hawaiian Society of Law and Politics". Archived from the original on 2012-08-19. Retrieved 2013-01-12. Michael Tsai (August 9, 2009). "Pride in Hawaiian Culture Reawakened: Seeds of Sovereignty Movement Sown during 1960s–70s Renaissance". Honolulu Advertiser. Documents and essays opposing sovereignty collected or written by Kenneth R. Conklin, Ph.D.